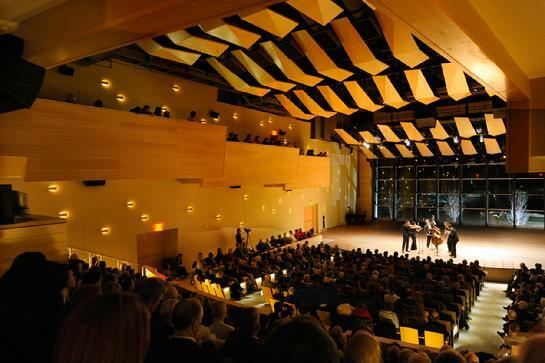 Skidmore College in Saratoga Springs, New York is a small liberal arts institution with a strong orientation toward the arts. In support of a distinguished music program, the college is constructing a new building to provide a 600 seat recital hall attached to a three-story academic wing which will contain classrooms, faculty studios, and practice rooms. The new building will be one of the first to be seen upon arrival to Skidmore. It works with the campus's axial plan in which arts buildings and science buildings are placed to the left and right respectively of the centerpiece library. The new building stretches from the arrival court to the larger landscape in a dynamic gesture that connects the academic quad with south park. Its linear plan creates a long edge which together with the existing Bernhardt Theatre and the current Filene Music Building will form an outdoor performance space. This protected wooded amphitheatre for both music and theatre looks toward the landscape of South Park as a backdrop. In addition, site work near the new building will provide a new water feature and arrival court for the college, on axis with the library and terminating a very beautiful entrance drive.